We shoot Real Estate, Interior Design and Luxury House photography for remodeling companies and design firms , Estate Agents and Estate Owners for their advertising, listings and display portfolios. CAPTURING YOUR PROPERTY WITH THE BEST PHOTOGRAPHY IS OUR MISSION - THE BEST PHOTOS WILL GENERATE THE MOST INTEREST FOR YOUR ONLINE HOUSE SALE OR MARKETING. Real estate photographer for house photography of all shapes and sizes. A comprehensive range of real estate photography can be booked from our services for people selling houses in the Sunshine Coast and hinterland region. As the Sunshine Coast Interior Design Photographer Specialist, we have the expertise and extensive experience to produce the quality work required by clients. Whatever the size, style, and age of your property having high-quality real estate photography should be of paramount importance. Best House Photos can produce property photography that will be eye-catching and help with your online house sales goals. Our customers can select from several Sunshine Coast real estate photography services and package prices including video production. Creating the best possible property photography for clients is our number one objective whether they are selling a home online or using interior design as marketing material for their hotel and resorts businesses. We can also help you with real estate marketing and display advice. We can help our clients with marketing the sale of their Sunshine Coast real estate or advertising of their services and projects with our social media network. When we have completed a client project we endeavour to make a series of social media posts advertising and highlighting the house for sale or the project we have photographed for them. This is a free real estate and marketing service for clients who book a package of our photography services. We can provide clients with all the visual marketing services needed to sell property online. Choosing a selection of our Sunshine Coast photographer and video products will provide a comprehensive and informative online property listing. Most of our clients select a Sunshine Coast photography package to include our quality interior and exterior real estate photography (including a twilight shoot in some circumstances), plus a property floor plan and some aerial photography and completed with a short video presentation of the property. With a package such as this, you are providing a visually exciting experience for the potential buyer viewing your listing! Read about our real estate photography and video services in more detail via the drop-down links below. Learn how we will photograph your property, how many photos we will take, learn how long it takes for us to deliver real estate photos, learn about why our photography services should be incorporated into your house photography and marketing strategy. The statistics show that close to 100% of Sunshine Coast houses sold are sold through online listings. But did you know that the statistics also show that potential buyers spend 60% of their time looking at real estate photography and only 20% of their time on the property description and the remainder on the agent details? 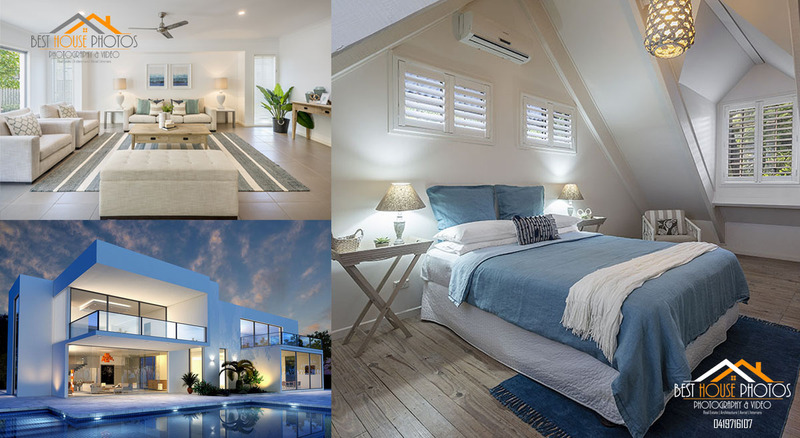 Its irrefutable evidence that your real estate photography will be the cornerstone of your online property listing and we offer superior quality photography to ensure your listing will look its best and in so doing attract and engage buyers. Your Sunshine Coast real estate photography will be in the best hands with our services, extensive experience and commitment to producing quality work. Do I need a property floor plan for my listing? Should you use aerial photography for your Sunshine Coast property sale? In most cases, we say yes. Aerial photography of your property may be as simple as having photos taken from minimal height to achieve a view over hedges or trees to higher vantage points to show where a property is located in relation to surrounding points of interest such as the sea, shopping centres etc. Should you use twilight photography for your property? In most cases regarding real estate property listings, we say yes and for some good reasoning. Considering how vitally important real estate photography is to the sale of a property and is a must-have, the cost is an extremely good investment. How difficult is it to sell a house without photos taken of the property? Answer - virtually impossible. 99.9% of Sunshine Coast property buyers will want to see photos of a house before they inquire or ask for an inspection. Quality real estate photography will strengthen your pricing position, poor photography weakens it. This has been statistically proven! We see it time and time again. Good real estate agents appreciate the value associated with good photography and unfortunately, there are some real estate agents that couldn't care less. A seller has much more chance to stay firm with their house price if the listing presentation looks great. The quality of the photography on the listing is the key to attracting your ideal buyer. Fact: It is possible to sell a property without an agent but you will have next to no chance to sell without photos! So, how important do you think your property photos will be? 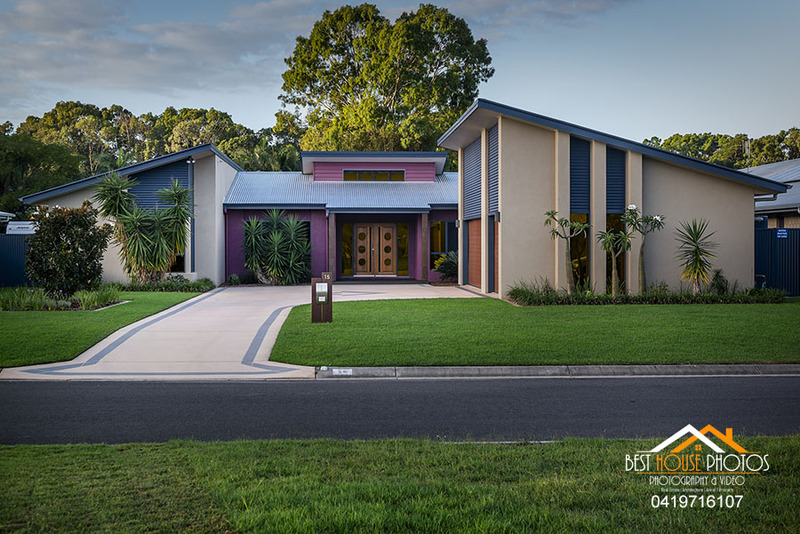 We conduct our real estate photography services not only on the Sunshine Coast and hinterland including Maleny, Montville, Obi Obi and Kenilworth but throughout SE Qld including the Gympie, Mary Valley region. ourselves on the quality of service and services.